Leading Leading general Leading general insurer is seeking exceptional graduate to join their team.Leading general insurer is seeking exceptional graduate to join their team.insurer is seeking exceptional graduate to join their team.general insurer is seeking exceptional graduate to join their team.The successful candidate should be exceptionally bright with a first class degree in a maths based subject. 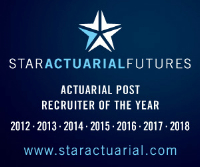 The candidate will be joining a highly motivated actuarial team and will be providing support for members of the team thus gaining exposure to a range of actuarial practices; thus must have a good attitude and be willing to contribute to a positive team atmosphere. Ideally the candidate has proficiency in technical languages such as R, VBA, Excel, SQL. This is an excellent opportunity to gain exposure within a world class insurer.